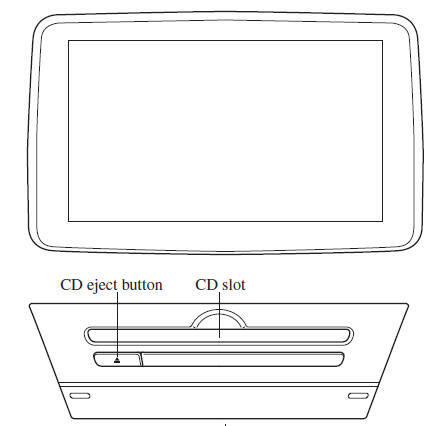 The explanation of functions described in this manual may differ from the actual operation, and the shapes of screens and buttons and the letters and characters displayed may also differ from the actual appearance. 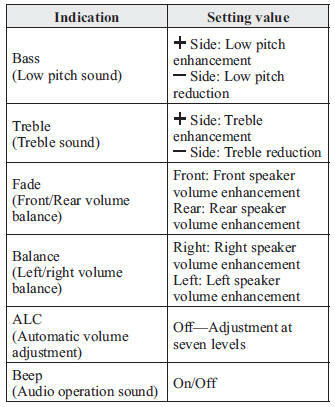 Audio Set (Type C/Type D) has three different human interfaces. For safety reasons, some operations are disabled while the vehicle is being driven. the audio MUTE on and off. Turn the volume dial to adjust the volume. 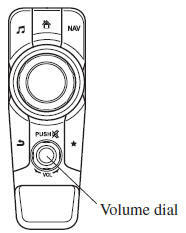 The volume increases by turning the dial clockwise, and decreases by turning it anticlockwise. done by pressing the switches around the commander knob. (Only navigation-equipped vehicles). 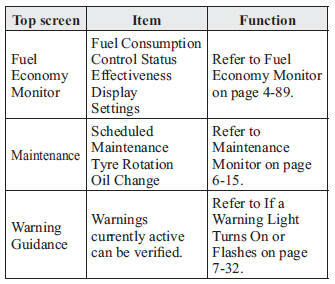 For operation of the Navigation screen, refer to the navigation system manual. 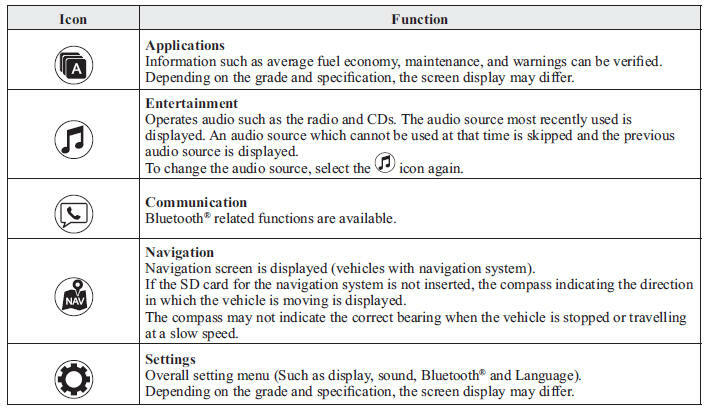 If the SD card for the navigation system is not inserted, the compass indicating the direction in which the vehicle is moving is displayed. Long-press to store particular items in Favourites. Tilt or turn the commander knob and move the cursor to the desired icon. Press the commander knob and select the icon. Long-press operation of the commander knob is also possible for some functions. Do not press the screen strongly or press it with a sharp-pointed object. Otherwise, the screen could be damaged. For safety reasons, touch panel operation is disabled while the vehicle is moving. Touch or tap on the item indicated on the screen. The operation is launched and the next item is displayed. Touch the setting item displaying a slider bar. Touch the slider with your fi nger and move to the desired level. Touch the screen with your fi nger and move up or down. Items which were not displayed can be displayed. Turn the commander switch volume dial. The volume switch on the steering switch can also be pressed. Select the tab to select the item you would like to change. The centre display can be turned off. Select to turn the display off. selected the centre display turns off and the clock is displayed. The daytime or nighttime screen can be selected. *1 The display is constantly on daytime screen when the illumination dimmer is cancelled. Adjust the centre display brightness using the slider. Adjust the centre display contrast using the slider. you would like to change. The automatic level control (ALC) is a feature that automatically adjusts audio volume and sound quality according to the vehicle speed. The volume increases in accordance with the increase in vehicle speed, and decreases as vehicle speed decreases. screen and display the Entertainment screen. 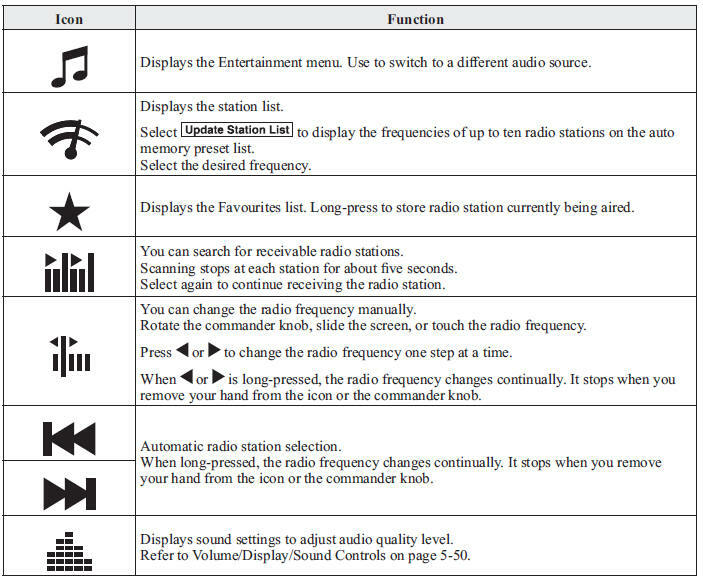 When selecting the desired radio, the following icons are indicated in the lower part of the centre display. Selected stations can be registered for convenient operation. Up to 50 stations can be registered. The Favourites list is common to AM and FM radio. register the current radio station. The registration can also be performed using the following procedure. The station is added to the bottom of the Favourites list. If the battery is disconnected, your Favourites list will be not deleted. Select the radio station name or radio frequency to tune in the radio station. Select the radio station or radio frequency you want to delete. Select a radio station or radio frequency. The selected radio station can be moved. Slide the radio station or move it using the commander switch, then select . FM is selected, each programme is selected. Selected stations can be registered for convenient operation. Up to 50 stations can be registered. The Favourites list is common to AM, FM and DAB radio. the current radio station. The registration can also be performed using the following procedure. 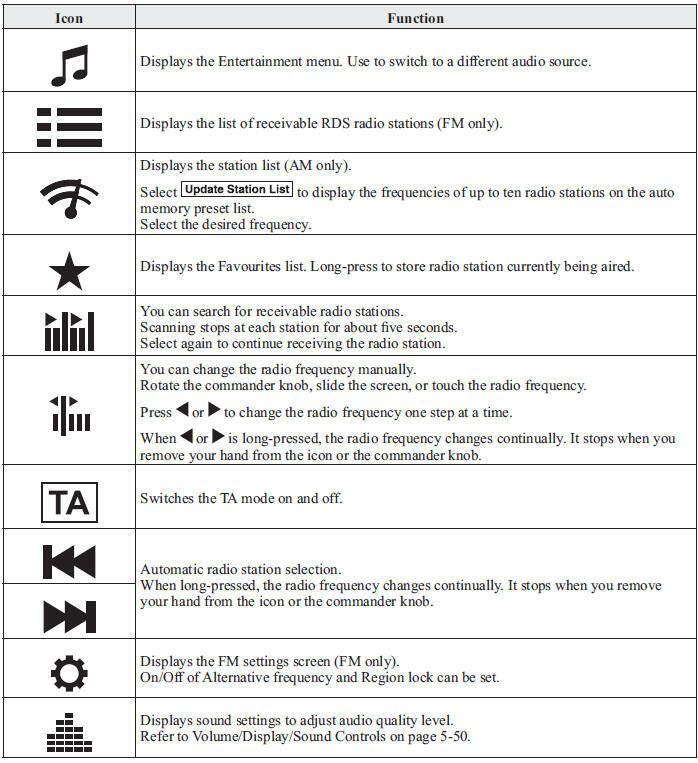 AF functions on FM stations. Turn on the AF mode. 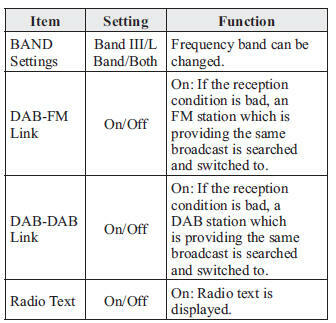 If the radio reception of the current station weakens, the system switches to an alternative station automatically. If you wish to continue a regional programme, turn on the Region lock (REG) mode. to switch to the FM settings screen. AF/REG on or off switching can be performed as follows: (AF mode on/off) Select On/Off on the FM settings screen. (REG mode on/off) While the AF mode is on, select On/Off. switch to the TA mode. If a TA broadcast is received while in the TA mode, the TA broadcast intercedes even while using other functions (FM, CD, USB, AUX, BT audio, Aha™ radio, or Stitcher™ radio), and “Traffi c Announcement” is displayed. selected, the selection screen turns off when a TA is received while continuing to receive TAs. List of receivable RDS radio stations is displayed. You can easily select the station you want to listen to from the list. If a radio station name is not available, the frequency is displayed. 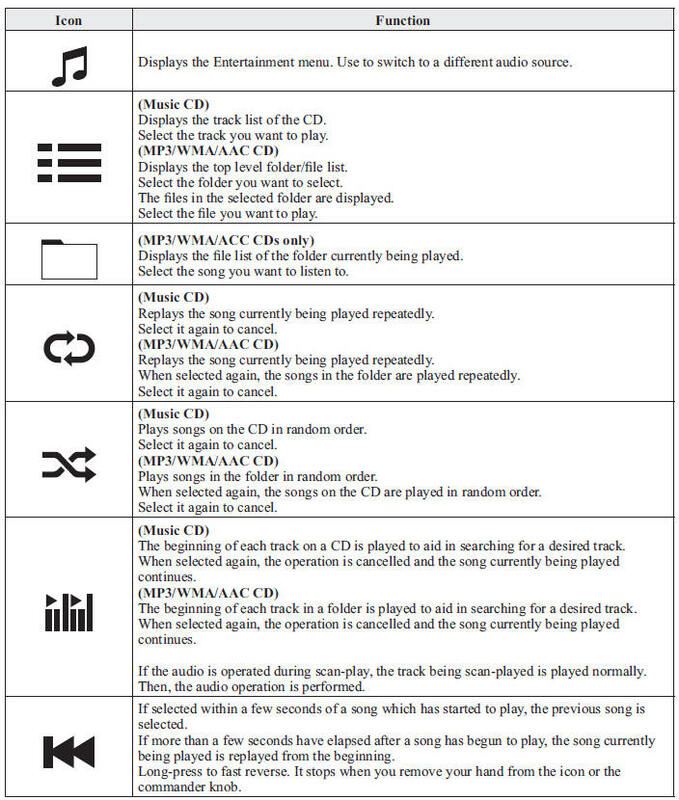 In addition, radio stations which have been programmed to a Genre code (Programme types like Rock, News, and so on) can also be displayed separately by category. It may take longer to display the station list depending on the reception conditions. station list screen to display the genre list screen. Select the genre to display the radio station list in the genre. Only one Genre can be selected. DAB radio is a digital broadcasting system for radio. DAB radio provides a high-quality radio sound source using an auto frequency switching function in boundary areas. By displaying the radio text, information such as the song name and artist name can be displayed. and display the Entertainment screen. icons are displayed at the bottom of the screen. ensemble you want to display. 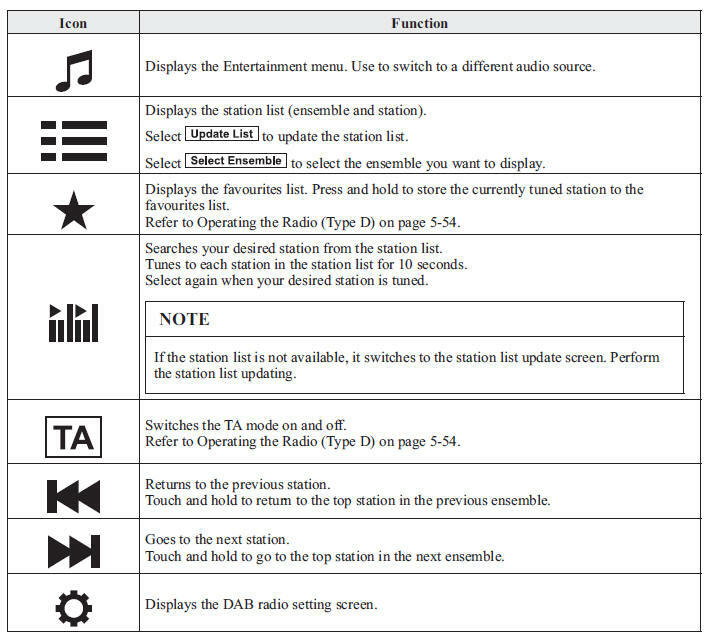 Select a desired station to start radio reception. 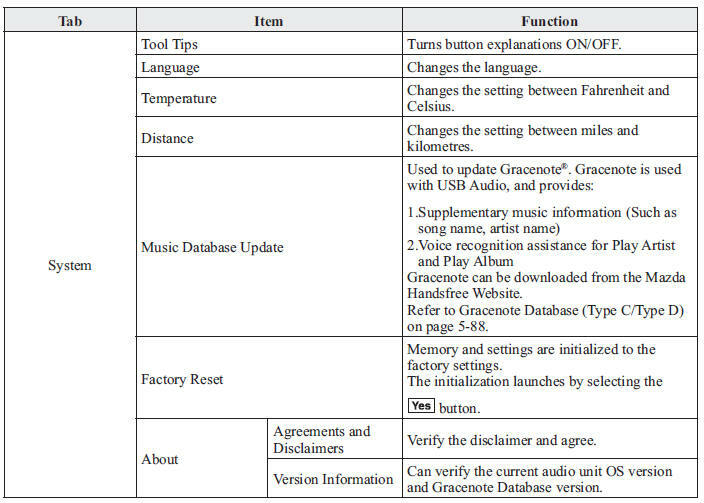 Select the desired item and perform the setting. The radio text may not be displayed depending on the radio station. The radio text cannot be displayed in DAB-FM mode. If there is no DAB radio signal, “Signal Lost” is displayed on the screen. 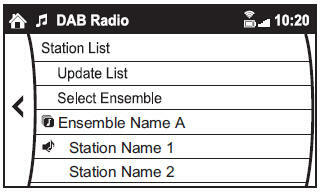 Change the ensemble or radio station, or perform station list updating. following icons are indicated in the lower part of the centre display. the folder/fi le list at the top level. Insert the DVD into the slot, label-side up. 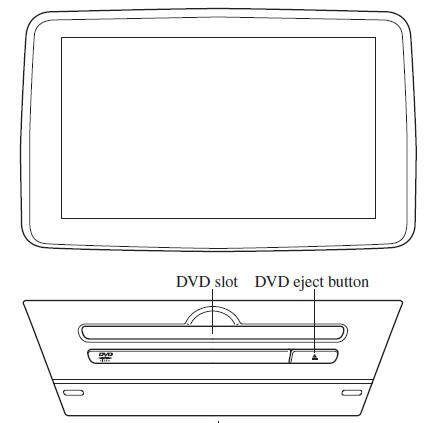 The DVD is inserted automatically and the top menu screen of the DVD disc and controller are displayed. There will be a short lapse before play begins while the player reads the digital signals on the DVD. top menu screen and the controller are displayed. When starting the playback by operating the controller, the following icons are displayed at the bottom of the screen. For safety reasons, images are not displayed while the vehicle is being driven. controller to move the controller. 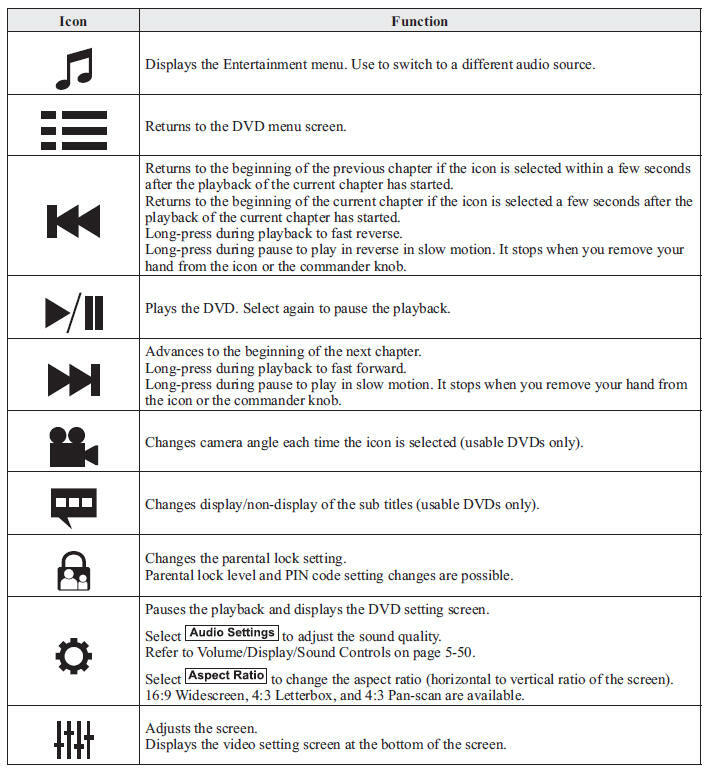 If the mode is switched to DVD mode once the DVD playback has stopped, the playback restarts without displaying the DVD menu screen. Sound quality and aspect ratio settings can be performed. 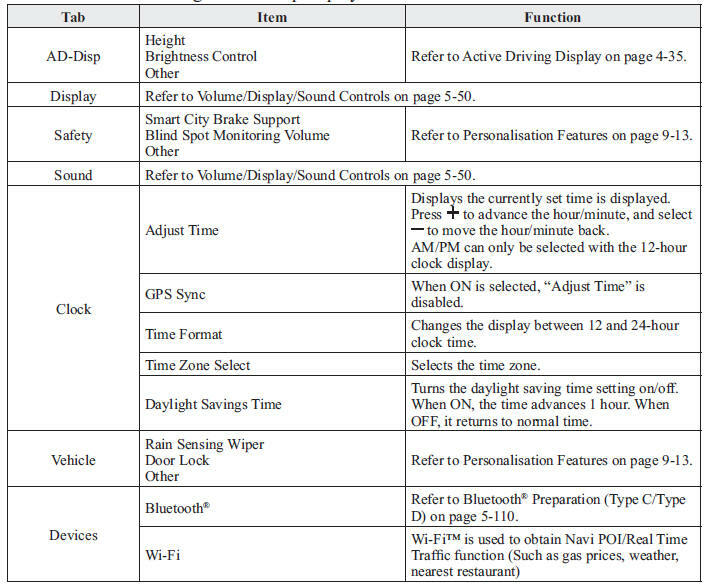 Refer to Volume/Display/Sound Controls on page 5-50 . Select a desired aspect ratio. Brightness, contrast, tint, colour density can be adjusted. the following tabs are displayed at the bottom of the screen. 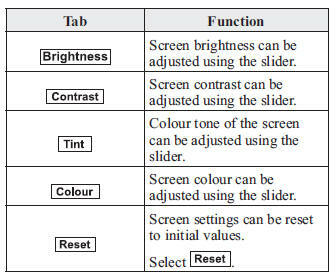 Depending on the grade and specifi cation, the screen display may differ. screen to display the Applications screen. The following information can be verifi ed.